I didn’t only take really heavy, painful pictures in Providence. 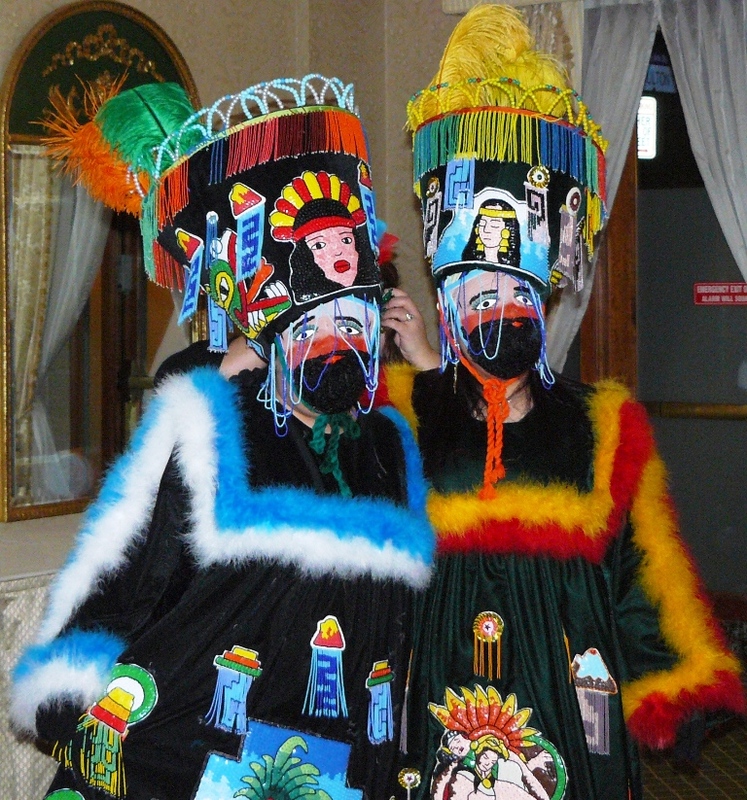 The ones I want to share tonight are of Maria and Rosario in costume on Friday night, doing the dance of the Chinelos, a traditional dance from the state of Morelos. I’m not actually sure who’s underneath that mask, but I think it’s Maria. The costumes are Maria’s. 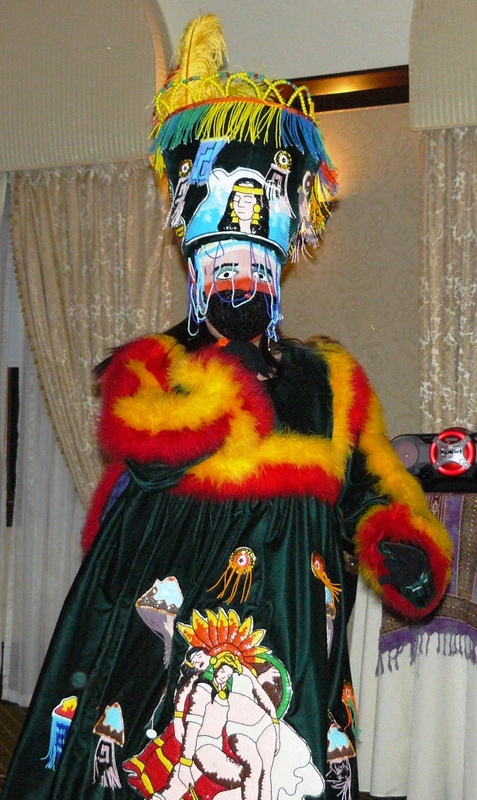 She and her family participate in many Chinelos dances. She brought her costume and her husband’s up to Providence. 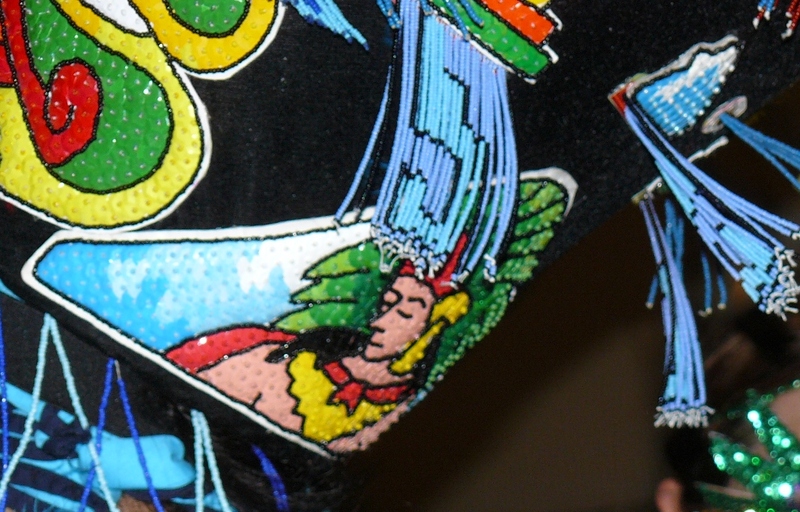 They are quite elaborately beaded and sequined. I’m still really thrilled that they were able to come to the conference, and so pleased that they wanted to participate in the performance on Friday night … and that Maria had these costumes to share! And here are both dancers, holding still for their photo op. And yes, going by hair alone, that’s Maria on the right, and Rosario on the left. There is a delightful article in Wikipedia: http://en.wikipedia.org/wiki/Chinelos that describes the dance (in what I think of as “creatively international English”, which is a use of the language that I favor), and recounts that the dance was a sort of rebellion against Lent, and originally made fun of the Spaniards (thus, apparently, the beards). Excellent. Should have known wikipedia would have the skinny! The costumes are very beautiful. I wish I’d gotten better up close photos. The detail work was so lovely! Those costumes are wonderful! I love the feather linings and shiny black robes. Yes, the feathers are quite fun, aren’t they?